Before writing up my annual year-in-review entry, I thought I'd post something light before the Holidays. I was going through a stack of old papers and came across a folder from early 2016 that contained all of my paperwork related to my Antarctic deployment from Dec. 2015 through Jan 2016. 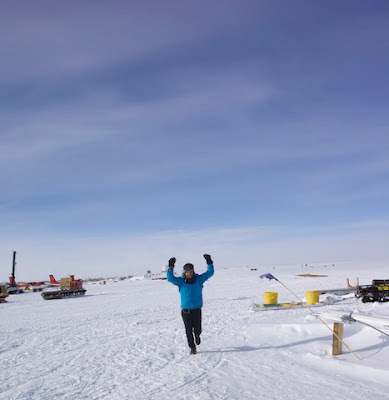 That year I was lucky enough to have been asked to participate in the South Pole Ice coring project, and managed to finally achieve a 39-year goal of mine: To stand on the very bottom of the world, and have every other human being stand North of me. I've written about this deployment on many occasions and wont focus on that in this short post. This post instead will focus on a rather ridiculous idea I had while sitting in the cafeteria one day before my ice-coring shift started. 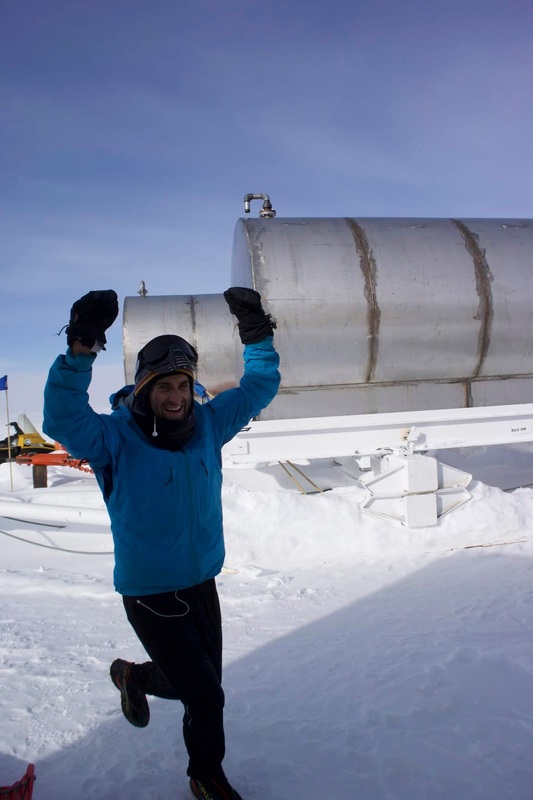 The idea was very simple: To run an actual ultramarathon at the South Pole. I had spent about an hour on station surfing the internet during the short window that the satellite was up...and was unable to find a single instance of someone actually running an ultra at Pole. Sure, there were many who have traversed the entirety of Antarctica, or skied thousands of miles to the Pole...and even those every year that run the South Pole Marathon. But in all my searching, I could not find a record of someone setting out to run an actual ultra distance at Pole and then documenting it. With this said, there are several ultras that are run in Antarctica, just not at Pole. An interesting side story: In 2011, I was stationed at a tourist camp in Antarctica called Union Glacier. While there, I was actually invited to run the 100k event that was being put on there. Dozens of tourists from around the world had flown to the station to run this event, and I was simply there to work on some remote seismic stations related to an NSF project. But I gladly accepted and was eager to take a stab at the 100k. Unfortunately, the plane bringing my group back to McMurdo station came the next morning (a day early) and I missed the race. I do still have my bib number though, as well as the official race shirt. 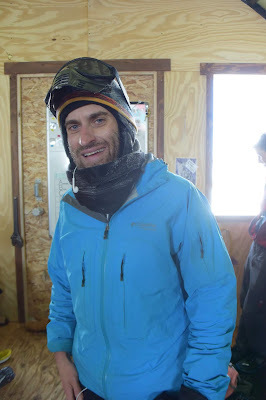 In late December of 2015, I arrived at South Pole for a month long deployment. 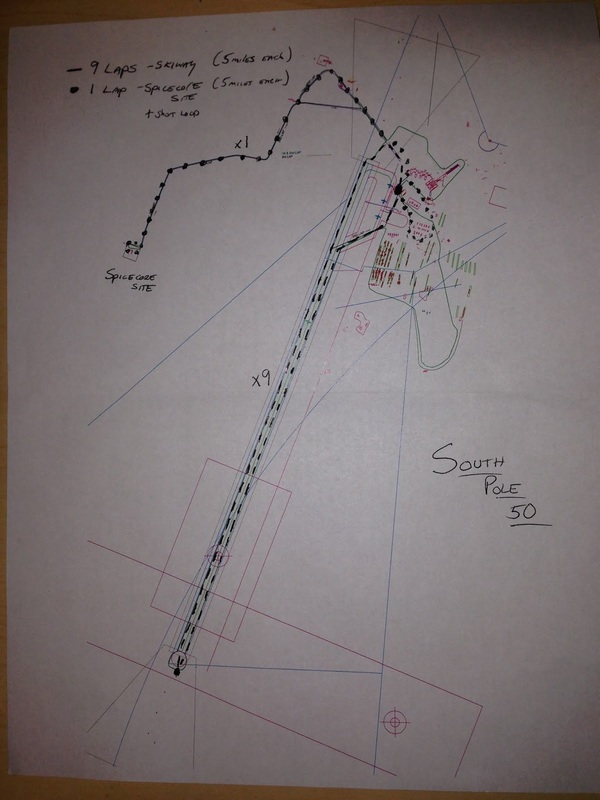 I would be working long shifts, 6 days a week...drilling and logging cores related to the "Spicecore" project. We were drilling to a depth of 1750 meters below the surface. Christmas came just a few days after arriving, and a tradition at pole is that the entire station does a "run around the world". This "race" constitutes the majority of personnel on station dressing up in silly costumes, and then running/walking a ~2 mile loop around the station. This loop circumnavigates the geographical pole, so everyone who completes the run, does in fact run "around the world", and through every line of longitude (and every time zone). It's a silly tradition, but a lot of fun. Most who run, go very slowly...but there are a few that race it hard. That year, we had three very fast runners in camp. One of the carpenters, Curtis, was a 2:40 marathoner. I did my best to race as hard as I could, but with the 10,000 foot altitude, cold temps, and heavy layers, I managed to only place 5th. Still, I had a blast. A week later, I was in much better shape. I had acclimated to the cold and altitude, and had been running regularly on the station treadmill. I had known for years that there was an annual sanctioned Marathon that took place in McMurdo Station. On any given year, there could be up to 50 runners attempting this. I had always wanted to participate, but every time I had ever been through McMurdo, it was never during New Years Day when the race actually occurs. BUT...what I came to learn at South Pole, was despite the much lower number of residents (~150 total), and the MUCH colder temps, there are those on station at Pole that always miss this marathon as well. So some years back, a few of the workers at Pole decided to run their own Marathon at the same time as the McMurdo marathon. Ever since then, it has become an annual event. Generally at Pole, there are roughly 3-5 finishers per year (although some people will ski the course as well). Once I heard about this, I knew I had to do it. The weather forecast for the marathon was absolute crap. Blistering temps (-40C), and horrible winds. The wind chill was in the -50's. This meant, even with all of my protective layers, I would have to stop in the stationed "warming huts" periodically to warm up. I knew any finish would be slow. I didn't care about time honestly though, and simply wanted to complete a marathon in Antarctica. So, on New Years holiday, I went out with about 15 others and started the marathon. It was a slow slog, often directly into the wind, and involved completing several loops. I was in 2nd place for most of the event (behind Curtis), but in the last 5 miles fell back to 4th. I finished in a smidge over 5 hours, but with almost an hour of warming breaks (about 4hrs 30 mins of actual running time). It was actually a lot more fun that I thought it would be....which is how I thought up the idea of the ultra. Finishing the South Pole Marathon! As the thrill of the Marathon wore off, and we all went back to normal work shifts the next day, I started thinking about a South Pole Ultra. Was one ever completed before? Had anyone ever attempted one? All of my research led me to dead ends. I was not able to find any solid evidence of a successful South Pole Ultramarathon attempt or completion. So....knowing this might be my only time ever at South Pole Station....I knew it would be my only chance to set the bar. I started my planning a few nights later after my work shift. I went out for a short run down and back on the station skiway (the "runway" for the plane) and realized that if a made a loop out of it, I could make it exactly 5 miles. This also meant I could attempt a 50-miler by doing 10 laps. I figured to be a truly legitimate "Ultra", I had to at least attempt 50 miles, if not 100k. My declared goal was actually to do a 100k comprised of 12 full loops, and a small 2-mile short loop to finish it off. I planned out my list with 13 check-boxes to use as a tally between loops. The beauty of the 5 mile loop down the skiway, was that I could use one of the station huts on the loop every 5 miles to warm up. This hut, known as the "chapel", was actually a small workshop that the fuelies use...so it did stink of jet fuel though. A bonus of using the skiway was that the surface was more groomed, meaning better footing. It would still be crunchy and difficult, but not like running on fresh Antarctic snow. The down side, is that the skiway is active. I had to do this attempt on a day with no flights scheduled. The only day that this is the case, are the Sundays...which also happens to be our day off. So...if I were to attempt this, I would be using my one off-shift, to run for what would likely be at least 12 hours. This wasn't an issue for me, as I had convinced myself that I had to go for it. What I came to learn during my attempt was that while Sundays are off days for the larger LC130 flights, the small Twin Otter planes do still fly. So during my 7th loop, I was forced to run a single alternate 5-mile out-n-back out the ice-coring site while Twin Otter was taking off. 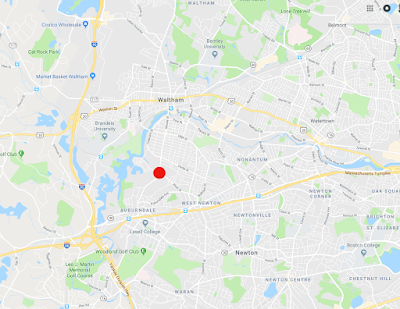 I had thought about spelling out the entire experience in a text run report in this entry, but I realized that I recorded videos of myself during warm up breaks. So, instead of boring text, I'm just going to post the video detailing the entire experience. It's almost all talking from the warming hut as my camera wouldn't stay charged in the cold. I heard a rumor that the following year, a fellow runner attempted to run the "2nd annual South Pole Ultra", but I don't know if he was actually successful in his attempt. At any rate, here are a few final pics and the videos of my entire experience. The 5 mile skiway loop. Log sheet showing my times, and that I stopped after 10 loops. Think I'll go warm up now. Around the World...and Back to Hardrock? On May 1st, 2007, two very specific things happened in my life. At exactly 4 PM EDT, I set my right foot down on the start of the Appalachian Trail for what would eventually become my first of many new adventures. It was with this step that I began my first thru-hike, a 2175 mile jaunt down the AT, as well as my renewed life as an explorer. But something else happened on that day. After having completed the ~8 mile approach trail hike up to the Southern Terminus and true start of the AT, I decided to start "keeping track of my miles". To get in shape for the AT, I had started to pick up running again the few weeks leading up to my start...something I hadn't really done since high school some 10 years earlier. For basically 10 years, I had done very little athletically, and let myself go quite a bit. Being a numbers guy, I thought what better way to keep myself motivated both during and after my thru-hike, than to keep track of my total "lifetime" miles. Now obviously starting "lifetime" miles at 30 years old, isn't very accurate. But since I had no way to truly gauge my miles up to that point, I figured why not start with this first step on the AT. I gave myself one "rule" regarding the logging of miles: Only running, and purposeful hiking would be log-able. Basically, if I considered my activity to be "athletic", and purposeful forward motion, it counted. My true passion-of-motion is fast hiking anyway, so I certainly considered those type of miles worthy. In retrospect, when I think of all the miles I've hiked during ultramarathons, this certainly holds as well. What I wouldn't log, would be any normal day-to-day walking that wasn't notably separate as its own activity. In other words, walking around downtown, or through the grocery store....doesn't count. I suppose what some today would consider "steps". During my hike, I logged miles using the official AT data book. Obviously there's some uncertainty in those numbers, and I never logged miles I hiked on side (or blue-blaze) trails. But, I treated the numbers I did log as a sort of "gospel". If the book said I did 26 trail miles, I logged 26 trail miles. When I got home, I searched the web for a program that I could use to log my miles. I stumbled across a program called "Runningahead" and went through the tedious process of transcribing all of my recorded miles from my AT hike over to the log. To this day I still use this website. Following my hike, I began to pick up running again in earnest. Every time I went for a run, I logged it. In early 2008 when I began training for my first marathon....I logged it. Later that summer when I thru-hiked the Colorado Trail....I logged it. 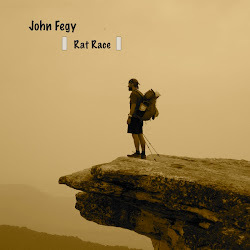 in September of 2008 when I ran my first 50-miler at the VT 50, I logged it. in 2009 when I ran my first 100 at the VT 100....I logged that too. Every training run, every training hike, every thru-hike, and every race. Every mile...was logged. And then one day, while I was deployed to Antarctica for my third season I noticed something. It was the 1 hour in the day that the internet satellite was up and I was logging my miles for a short run I had just done out on the skiway. I entered in those miles and realized my total logged miles were just a few under 10,000 total!. I couldn't believe that number was real. Had I really run 10,000 total miles since my first day on the AT? 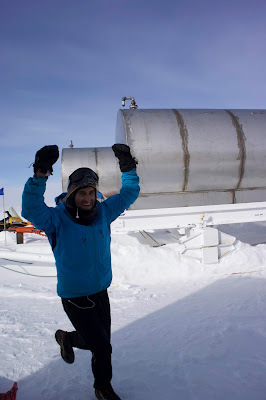 Running my 10,000th mile at WAIS Divide Antarctica. The years marched on, as did my running. I began running and racing a lot. 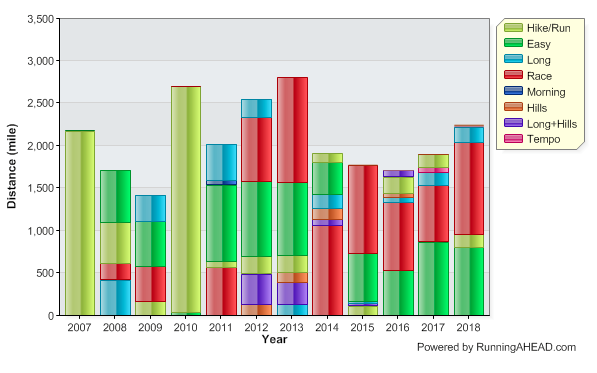 My yearly totals were consistently topping 2000, or even 2500 total. It was just a couple of years ago when I noticed that I had surpassed 20,000 total miles....and again celebrated. This past weekend was another quite memorable one for me. Like last year, I had again placed my name in both the Western States and Hardrock Lotteries. Having just run both events (WS in 2017, and HR this past year), I had no expectations whatsoever that I'd be chosen for either. My odds for Western States were about 3%, and with my Hardrock entry now going through the "Else" lottery, my odds were about 15%. Both were low enough that I had assumed and expected to not hear any news. I was just hoping to "bank some tickets" as it were. 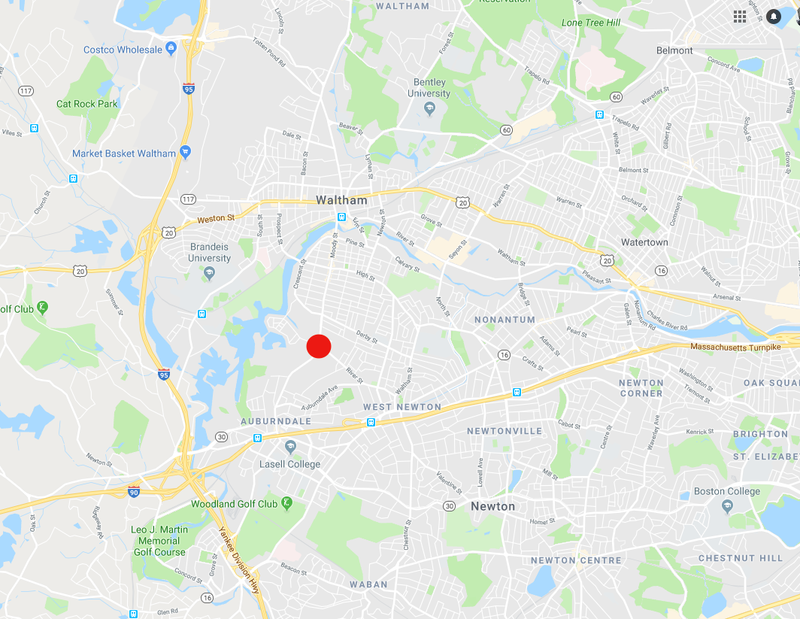 Like last year, I was registered for a local 50k run in a nearby rocky/rooty park in Boston called the Middlesex Fells. This year I had actually planned to cancel the event as I was supposed to travel to visit family. Due to many project deadlines at my lab, I just wasn't able to get out of town in time to start the long drive though, so decided to just stay home, rest, and visit in a couple weeks instead. But...I forgot to actually cancel my run registration. That night as I was falling asleep, upset that I had become so stressed, and ultimately not able to visit family, I remembered the run. I decided I needed nothing more than some therapy time on the trails. I set my alarm for 6 am, and decided to just go and play at the 50k. This particularly 50k run has marked the "end" of my ultra season three different years, so it holds somewhat of a special place in my heart too. It also always seems to happen on "Lottery Day". Last year, I turned my phone off as I ran the 50k, and didn't check it until I got home. I wanted to enjoy the day before learning if I had been drawn in the lotteries. Thankfully, after 8 years of applications, last year I was finally drawn to run Hardrock. It was quite an emotional day. But this year, knowing my odds were so low, and being so bummed about the canceled family trip, I just wanted a day in the woods and on the trails to clear my head. The forecast was calling for sunny and cool weather. Perfect for a day on the trails. From the moment I started the race, to the moment I finished, I was happy. It was a perfect day, and I felt at peace out there. It felt like a nice way to close my 2018 ultrarunning chapter. When I got back to my car, I had a smile on my face. I had seen friends, enjoyed the trails on a perfect day, pain-free. I had completely forgotten about the lotteries. I sat down in the drivers seat of my car and picked up my phone. There was a text message from a number that I didn't recognize. I opened the text and immediately saw a picture I had sent to some friends I visited back in Durango CO a few months ago. Incidentally, I had met these friends on the AT back in 2007. My thought was, "I wonder why 'Stitch' (aka Ben) is texting me?". Then I saw the text. It said simply, "Woohoo! 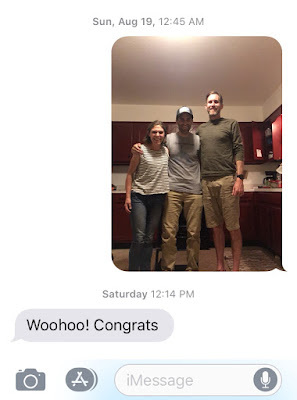 Congrats"
Congrats for what? And then it hit me. Ben is also an ultrarunner. Ben came to see my finish at Hardrock last year and lives in the San Juans. Ben has been entering the Hardrock lottery for the past couple years. No...Effing....Way. There is no way I got into Hardrock again. Not in my first year since running, and only with 15% odds. Ben must have mis-read. I opened twitter and saw my name drawn 10th in the "Else" Lottery. My heart started racing. This cannot be real. And then it hit me like a wave. No, not a wave of excitement like last year, but a wave of something different. There is a large part of the ultrarunning community that is, shall we say, less-than-thrilled with the way the Hardrock Lottery is configured. The race, by design, does favor veterans, and makes it incredibly hard for virgins to get into the run for their first time. Heck it took me 8 years. But once in, you are moved to a different lottery, and immediately your odds go up. With a single finish, my odds this year were ~15%....or about the same as someone with 6 years of tickets in the "Never" Lottery. I will not comment on the lottery configuration in this post, but needless to say, I felt an immediate and horrifying sense of guilt when I saw that I was drawn. People are gonna be pissed at me I thought. I was just hoping to bank some tickets and after a few years, maybe get selected again. But here I was, selected again, my very next year applying. The drive home was very contemplative. I wasn't sure how to feel. Should I be happy that for once the luck fell my way and that I'd get to run the Hardrock....AGAIN....AND in the opposite direction!? Awesome right!? Or...should I feel like I am part of the veteran problem at Hardrock? This same feeling is what ultimately led me to stop applying to Barkley. I felt like after 4 years of running it, that I was taking a spot away from someone else who should have a chance at giving it a go. But with Hardrock, even if I gave up my spot, it would just go to another person on the "Else" list...not a Virgin. What made the guilt worse was that I found out two additional pieces of information. I found out that there was one Virgin applicant who had 512 tickets in the Never lottery....and was NOT drawn. My heart absolutely sank when I thought of him. I remember how bummed I was when I didn't get in with 64 tickets. I couldn't imagine not getting in with 512. 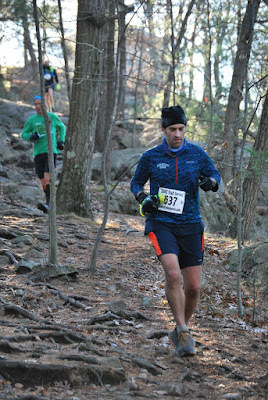 Then I see this article published over at MassUltra (a great website btw), stating that I was the ONLY New England applicant to be selected for Hardrock this year, including 24 applicants from MA. It certainly reinforced just how unlikely my lottery draw was. When I got home, I immediately booked a room in Silverton to hold it, to give me time to think about it. I made the mistake last year of waiting a week and everything was sold out in town. We did manage to get a room for the night after the run last year, and we had a camper van for the other nights. This year, I was able to secure a room early...but the motel I went with already was nearly sold out. I've talked with friends and family, and all assure me not to feel guilty, and that I just got lucky this year....but it's hard. A very very big part of me wants to be out there in the San Juans, experience that ridiculously beautiful course again...but my heart keeps telling me that in some ways, it feels wrong...and that somehow it would be selfish of me. When I look at my finish picture from last year, the emotions definitely well up. They tug at the very fibers of my soul...somehow whispering to me to, "come back". I recall in vivid detail the shear joy and profundity I experienced out there on that course last summer. Watching the sun rise from atop Handies Peak, was like touching the envelope of the Universe itself. It was magical in all sense of the word. There's also nothing quite like the San Juan mountains. They hold a unique character and splendor unlike any other mountains I've experienced...and I've experienced quite a few. There's a reason I rank them among my favorite mountains in the world (thus far). I suppose in some ways, that by just entering the lottery, that deep down I at least wanted the chance to run again. I had to know that however small my odds, I would still have a chance of being selected. Perhaps my subconscious is just inherently selfish, as much as I like to tell myself that it isn't. What does that say about me? Maybe I'm just over-analyzing all of this and I simply did just get lucky, and should be ecstatic like last year. So, am I excited? Of course. I genuinely would love to run the Hardrock again, to experience that awe and wonder again. I am so completely honored and humbled to be invited back. But still.....this unexpected news weighs a bit heavy. Lots to think about. Lots to ponder. After my heavy thoughts of the weekend. I finally went in to log my miles from the TARC Fells 50k race. I noticed my total "lifetime" (since May 1, 2007) miles were now just shy of 25,000. In fact, the mileage was exactly 24,897. Why this specific number caught my immediate attention was because it was only 4 miles short of 24,901 total miles. 24,901 miles also happens to be the circumference of the Earth at the Equator. Of course there are a lot of miles in my logs that probably weren't recorded, or that were rounded, or that my GPS watch calculated wrong....but whatever the case, my published number was most certainly low. As I stated above, putting aside the uncertainty, I like to treat my miles log as truth, so to speak. So to me this meant I was just 4 miles short of being able to say that I've, "Run/Hiked around the World". That is a mind-bending thought considering I have done all of those miles in my 30's and now early 40's. "Well...what do you know. I've now run around the world. 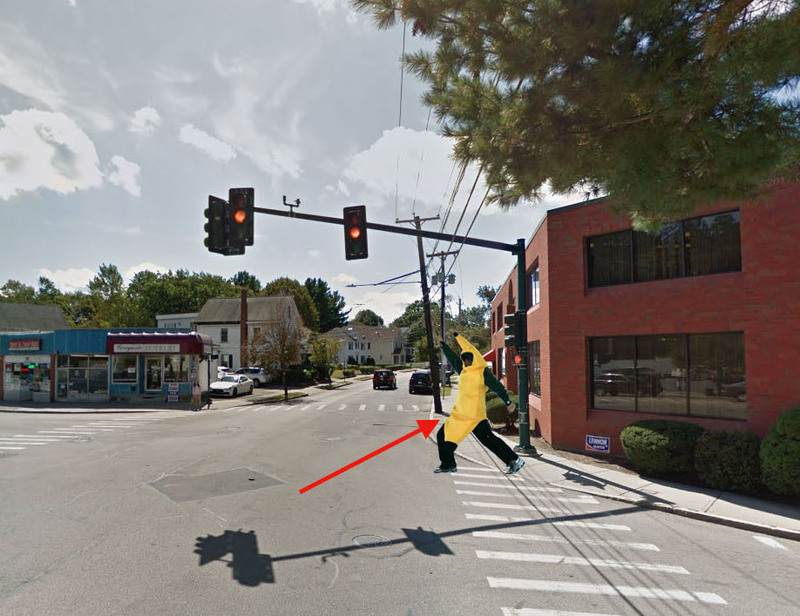 Right here at this random intersection"
It was as profound as it was ridiculous. She gave me a high-five, the light turned green, and we continued on running immediately talking about something else. What a bizarre, surreal, and yet memorable morning. I finished the run and my totals now read, "24,902". In a short 98 miles, I'll hit 25,000...another ridiculous number to keep me motivated. "Huh...I just ran around the world. Neat. Where to next?" Where I completed my "Around the World" Run.